Zions Bancorporation bucked the trend on another lousy day for bank stocks, with shares rising slightly after the company finished repaying TARP. NEW YORK ( TheStreet) -- Zions Bancorporation ( ZION - Get Report) was the winner among the largest U.S. financial names on Wednesday, with shares rising slighlty to close at $20.37. The broad indexes all declined amid continued uncertainty in Europe, with protests in Spain and Greece over austerity government austerity measures, heading into the Spanish government's budget announcement Thursday and amid budget negotiations in Greece. Commenting about the Spanish government's reluctance to request aid from the European Central Bank, Deutsche Bank fixed-income analyst Jim Reid said early on Wednesday that "with the central bank liquidity guns loaded any short-term set back is unlikely to be severe but until Spain requests aid it's hard to see risk assets making much progress. Clearly such a request could come in the next few days but it's more likely in our opinion that it won't until a bit more market pressure is applied to the situation." Reid added that "there are also those who think that a request for aid is unlikely to come before key regional elections on October 21st." The KBW Bank Index ( I:BKX was down 1% to close at 49.20, with all but four of the 24 index components showing declines. 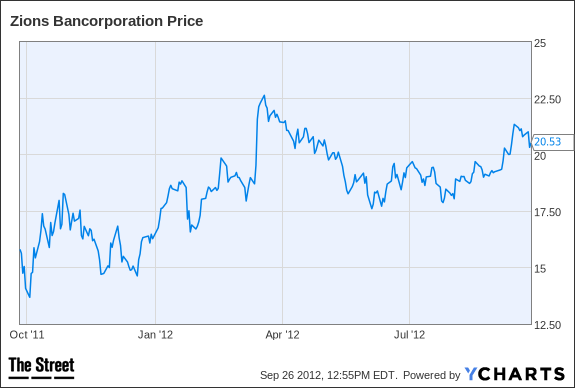 Shares of Zions Bancorporation of Salt Lake City have returned 25% year-to-date, following a 33% decline during 2011. The shares trade for just over their reported June 30 tangible book value of $19.65, and for 12 times the consensus 2013 Earnings estimate of $1.75 a share, among analysts polled by Thomson Reuters. The consensus 2012 EPS estimate is $1.15. Zions announced on Wednesday that it had repaid its remaining $700 million in federal bailout funds received in November 2008 through the Troubled Assets Relief Program, or TARP, having repaid $700 million in TARP money during the first quarter. Zions CEO Harris Simmons said the company was "pleased to report that we have completed the steps that we had proposed to the Federal Reserve in January, which were accepted as terms to redeem the TARP shares," and said that the preferred stock redemption was expected to "increase our annualized return on equity in the fourth quarter by approximately one percentage point compared to the third quarter results." Zions will report its third-quarter results on Oct. 22, after the market closes. Analysts polled by Thomson Reuters estimate the company will report third-quarter earnings of 33 cents a share, although estimates will no doubt be changing as a result of the TARP preferred redemption. The company reported second-quarter earnings applicable to common shareholders of $55.2 million, or 30 cents a share, increasing from $25.5 million, or 14 cents a share, during the first quarter, and $29.0 million, or 16 cents a share, during the second quarter of 2011. The earnings improvement mainly reflected "dividends and other investment income from private equity investments," primarily at its Amegy subsidiary. The second-quarter results were also boosted by a $32 million release of loan loss reserves. Guggenheim Securities analyst Marty Mosby has a neutral rating on Zions Bancorporation, with a $23 price target, and on Friday predicted that investors would see "favorable short-term headlines" heading into third-quarter earnings season. In addition to the repayment of TARP, Mosby predicted that the company would "likely report stronger loan growth than expected in 3Q12... and see an increase in reported earnings per share due to less debt conversion costs." Mosby raised his third-quarter EPS estimate for Zions by a nickel to 42 cents. The analyst estimates the company will earn $1.32 a share for all of 2012, followed by 2013 EPS of $1.96. Mosby said that "after achieving the full benefit from the TARP repayment and lower debt conversion costs, we have forecasted that net interest margin compression and less release of loan loss reserves could stall quarterly earnings at around the $0.50 level until 4Q13," and that "ZION's Recovery: ZION's recovery could take longer than other banks' as the two levers of capital restructuring and the eventual rise in short-term interest rates could take the next three to four years to complete." After those events take place Mosby sees "we see significant upside potential for ZION."